Route map highlighting the points of geological interest along Route 4. 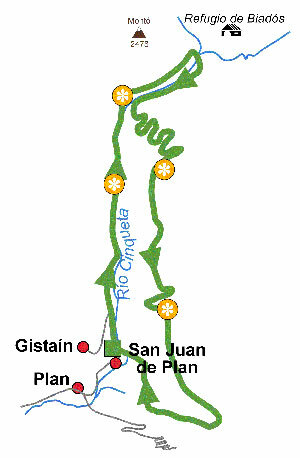 San Juan de Plan-White Virgin-(Biadós)-Abet Pool- San Mamés Hermitage-San Juan de Plan. Granite is a light coloured rock formed from magma which consolidated before reaching the crust's surface. It is formed by minerals made up from crystals that can be seen by the human eye, mainly quartz and feldspar, with some variable quantities of biotite and hornblende. At the end of the Paleozoic, the prevailing climate in the continents was warm and dry. Under these climatic conditions, clays, limes and reddish sandstones (Buntsandstein facies) were formed, currently taking up large areas in Europe. Peat is a type of low-quality coal which is being currently formed in this wetland, by the transformation of vegetation into peat.